"On the slopes of Long's Peak in Colorado lies the ruin of a gigantic tree. Naturalists tell us that it stood for some four hundred years. It was a seedling when Columbus landed at San Salvador, and half grown when the Pilgrims settled at Plymouth. During the course of its long life it was struck by lightning fourteen times, and the innumerable avalanches and storms of four centuries thundered past it. It survived them all. In the end, however, an army of beetles attacked the tree and leveled it to the ground. The insects ate their way through the bark and gradually destroyed the inner strength of the tree by their tiny but incessant attacks. A forest giant which age had not withered, nor lightning blasted, nor storms subdued, fell at last before beetles so small that a man could crush them between his forefinger and his thumb." Maybe you find yourself as I do in the high-country, being distracted when game is scarce by marveling at the giant rampikes that dot ridges both far and near. These giant bleached trunks that each would have an incredible story to tell if they could talk. Stories of the giant bucks that had passed them through the centuries, maybe of struggles between hide, tooth, and claws as the circle of life between prey and predator unfolded beneath them. These ghostly skeletons with arms outreached calling out to you to visit the high-country. Like the monarch tree that fell in Colorado, the small things can tear you down in the mountains, especially in the high-country. 2016 found me the proud owner of a coveted buck tag, two times in a row putting in for this unit. 2014 drawing of this tag has been a great memory filled with lots of sweat, good companionship, and three nice bucks including Trashy the nice 6x8 non-typical we were able to harvest. So I was excited to hit the cliffs and steep slopes again. 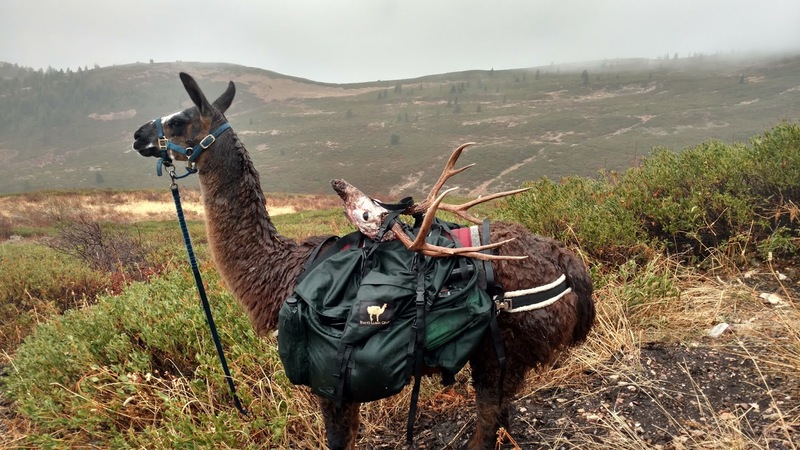 This year was different though, due to commitments throughout the season none of my hunting buddies were able to go, so I built some cheap racks to put into the back of my truck and told Romeo the llama he and I are going exploring. He got really good at walking up and jumping into the back of my truck like a dog does, I swear if he had a long tail he'd be wagging it. Beginning of the season found us finding very few bucks, but several mt. lions, resulting in a very late night skinning out a 6' tom, not a bad problem to have. Romeo and I had traversed the unit to all different parts that we had not been before in hopes of finding a good buck. 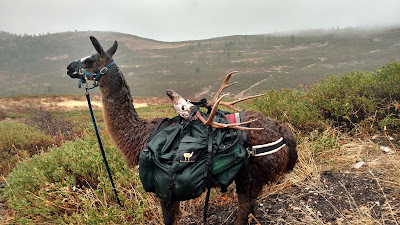 Unfortunately the deer had different habits this year, where bucks were plentiful in the higher elevations two years prior were now devoid of neither hide nor antler. Needless to say I was getting down and discouraged and was playing with the idea of just shooting the next small four point that presented itself, and moving on with life that I had put on hold for the last month in search of the one. People ask me often what kind of buck I am looking for when I go deer hunting, I tell them I'll know when I see him, and that is the honest truth, it is almost magical when you see them in the optics of whatever you are using. Maybe a heavenly glow if you will, envelopes their rack and body, and then you know, you definitely know. Cathedral made his debut six days before the season was to close. That is exactly what I thought when I first saw him in the spotting scope going straight up the mountain following a doe. His G3's stood straight, tall, and narrow like the spires of a great cathedral church, and I said to myself there has to be two feet of bone from skull to the tips. It was getting dark and very little time that resulted in a failed attempt at a stalk and no cathedral with a nasty straight uphill climb for Romeo and I out of a rockslide and waist high manzanita bushes. Day 2 in the evening we were right back there but on the other side where Cathedral had been 1500 yards from the evening before, but we were disappointed as we didn't see any deer, but were entertained by three giant bull moose. Day 3 was a day that I will never forget, cue in the little beetles that topple trees. It was 45 minutes before dark and we were in the next drainage over where Cathedral was heading to the night I saw him. Things became a blur in my mind because it was a very accelerated 45 minutes. Spotting scope reveals a nice buck with lots of does, only problem is they are about a mile away and downhill. Logic usually tells you to hunt uphill so the hike out is downhill, thus making it easier on yourself being tired from hiking all night. Such was not the case, but the opposite now as the roads in this country were all up high, enter beetle #1. Romeo and I dogtrot down through the draw and over to the other side and I tie him to a sage brush find a flat spot and setup, it is getting very dark now and the rangefinder reads exactly 500 yds. I dial the turret for said yardage and try to find the buck, abut he is nowhere to be found among the does. Enter beetle #2 as now I'm acting franctic and full out running down the ridge 400 yds, the slivers of shooting light are almost gone as I come to the edge of what looks like stair stepped plateaus, and there he is at 70 yds broadside with only 4 inches of his back exposed. I aim confidently and fire, boom, nothing, he runs down the hill at 200 yds and stops broadside, chip shot, boom, nothing, he hesitates and runs down the ridge another 400 yds and disappears into the darkness as it is now to dark to shoot, yet alone make him out amongst the does. I probably swore about this time, I don't remember, all season I had worked so hard to get to that point, I had worked hard all night to get to that point, and I blew it on two very easy shots. Then I realized after the adrenaline had dissipated that in the hurry I had not dialed my turret back down to zero after having dialed up to 500 yds moments before. Both shots had gone high, which offered little relief, due to the fact I had just walked down to check for blood the 400 yds downhill where I last thought I saw him. Adrenaline gone, I'm now exhausted, I have to go find Romeo, it's pitch black, raining, and I have a 2000' vertical walk out of here with a cheap headlamp on that barely illuminates 10 yds in front of me. Oh it gets better, I hike up to where I think Romeo is, or at least where I see eyes shining, and find out they are moose eyes, that bolt along with my bowels when I get close, just kidding about the bowels, but a moose is a big animal especially in the pitch dark. This happens about two more times with the eyes thinking they are Romeo, but find out they are deer. Hard to put into words what despair feels like when you are tired, wet, can't find your friend and have to leave him on the mountain for the night, and you have a LONG ways still uphill to the truck through waist high manzanita brush, unless you have been there before. Long story short, after an eternity and several breaks, I made it back to the truck and drove home defeated. Day #4 chasing Cathedral was the next morning, enter beetle # who knows how many by this point as I walk out the door, it is raining and very foggy and I have to try and find Romeo in this. I get to the top of the mountain, I'm very sore from three days of climbing this mountain, irritable because of the weather and lack of success finding Cathedral, worried for Romeo and hope that a mt. lion didn't make a meal of him during the night. Luckily on my descent the fog burns off and is only at a certain level, but everything I own is soaked and wet. I glass the open hillside where last night's proceedings took place and cannot find Romeo where he should be. I do see what looks like a nice buck in proximity of where Romeo should be, so I take off. I get within 100 yds of the buck who is with three does, but he has his head in the bushes and I can tell he is a four point. He sees me, lifts his head and skylines his antlers and my mouth drops as it is Cathedral, usher in background inspirational music as all despair, sore muscles and whatever else I was feeling sorry for myself feelings were instantly dissolved. The turret was right this time and with a quick shot Cathedral made his peace right their in that high country basin. The story gets better as I look up the hill where the does had gone and I see a familiar face starring down at me not 70 yards from Cathedral. Romeo had been laying there the whole time watching what went down with a big smile on his face humming as llamas do. Cathedral is 23" from the skull to the tips of his G3's, his two inch cheater makes him 24", and he grosses 181" My goal starting out the season was to shoot a 190" buck, true several bigger deer were taken off the mountain in terms of inches, but I can honestly say few had the experience I had in the journey of Cathedral in the high-country. I learn about life in the mountains, nature in it's raw form through the elements of weather, beauty, and physically, mentally demanding experiences are best echoed through the words of the magician David Blaine about how he prepared to break the record for holding your breath under water. "As a magician I try to show things to people that seem impossible, I think magic whether I'm holding my breath or shuffling a deck of cards is pretty simple, it's practice, it's training, and it's experimenting while pushing through the pain, to be the best that I can be. That is what magic is to me." He went onto break the record by holding his breath for 17:04 minutes, at 8 mins he was 100% certain he wasn't going to make it, but he pushed through to the end, I encourage you to go and do likewise. Romeo after his long night alone on the mountain, getting ready to pack Cathedral off the Mountain, I love this llama! Thanks again for another great article! I wish I could have made it with you a few times on that hunt.